BROCKTON, Mass. – It was a roller coaster ride for the Mansfield Hornets on Friday night at Campanelli Stadium in Brockton. 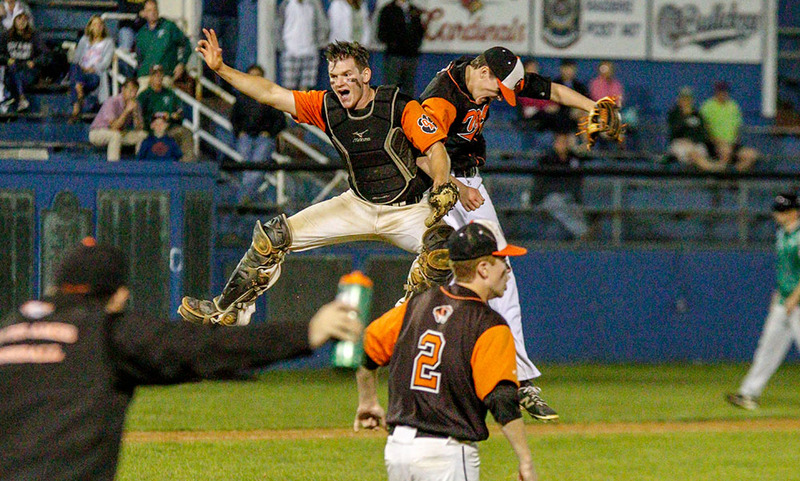 Trailing 7-2 and just one out away from elimination, Mansfield orchestrated an improbable comeback. Seven straight Hornets reached safely, including six hits, resulting in five runs that tied the game and sent the game to extra innings. But as quickly as the Hornets got back into the game, the roller coaster ride came to a screeching halt. Walpole bounced right back in the top of the tenth, scoring three runs on three straight hits with two outs, taking a 10-7 decision over the Hornets. With the loss, Mansfield is eliminated from the Super 8 tournament. Walpole scored a run in the fifth, two more in the sixth, and broke the game wide open with a four-run seventh inning to take a 7-2 lead over the Hornets with just two innings to go. It looked as though the Rebels were ready to celebrate with a 1-2-3 ninth inning when starting pitcher Matt Donato got the first two outs in just five pitches. 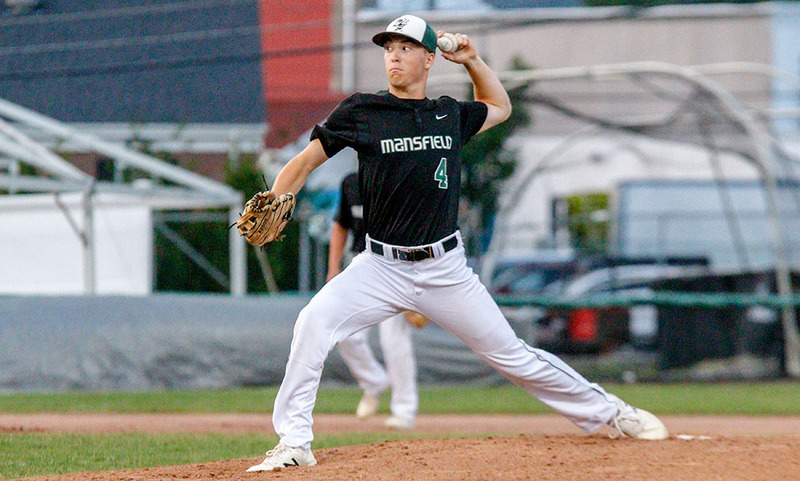 Breen called upon Chris Kelleher for a pinch-hit attempt and the senior delivered, giving Mansfield a chance with a single. Junior Mike Hargadon followed up by sending the second pitch he saw over the wall in left field for a two-run home run – the first of his career – to bring Mansfield within three runs with two outs. Leadoff hitter Sam Nugent kept the rally going with a single and junior Dan Saraceno followed with his first hit of the game to put runners on first and second. The Hornets executed a double steal and senior Kevin Dow launched the next pitch he saw into left-center field for a two-run double, making it a one-run game. Walpole elected to walk senior Tyler Dalton (two hits) but senior Justin Pena cashed in with his chance, driving the ball up the middle to bring Dow in for the tying run. With a Dalton at third, Donato finally got the third out with a fly ball to right. Walpole responded in the top of the 10th with its own two-out magic. Matt Falvey drew a one-out walk but a fly ball to center gave the Hornets the second out. Tyler Page picked up his first hit with a single that got by the Mansfield outfielder, allowing Falvey to score and Page to take second. Bryan Kraus and Chris McLean followed with RBI doubles to give the Rebels a 10-7 advantage. Kyle Moran reached on an error to lead off the bottom of the 10th inning but Rebels reliever Matt Chamoun got three straight outs to seal the win for Walpole. After four scoreless innings, Walpole took the lead with a run in the top of the fifth. Brett Lavanchy battled to a leadoff walk, took second on a sac bunt, moved to third on a groundout, and scored when Falvey was called safe at first for an infield single. Mansfield responded right away in the bottom half to tie the game. Cullin Anastasia beat out an infield single to lead off and took second on a groundout. With two outs, Hargadon got a blooper to fall in shallow left-center to plate Anastasia. Walpole added to its lead with two runs in the top of the sixth. A double from Kraus preceded a triple from McLean that was ruled to have just landed in fair territory. McLean scored on a squeeze play to make it 3-1. Dow (no decision) finished with five strikeouts, two walks, six hits, and three earned runs in six innings of work. The Rebels’ bats came alive in the seventh inning. Aidan Murray singled and a triple from Falvey made it 4-1. Falvey scored on a hit from Hanifan while Page reached (and Hanifan took third) on an outfield error. After a hit batter, a McLean sac fly made it 6-1. Lavanchy came through with a two-out RBI single to make it 7-1. Mansfield cut the deficit to five with a run in the bottom of the seventh. Hargadon got things started with a two-out single and went to third on a double from Nugent and came home to score after the ball got by the outfielder. 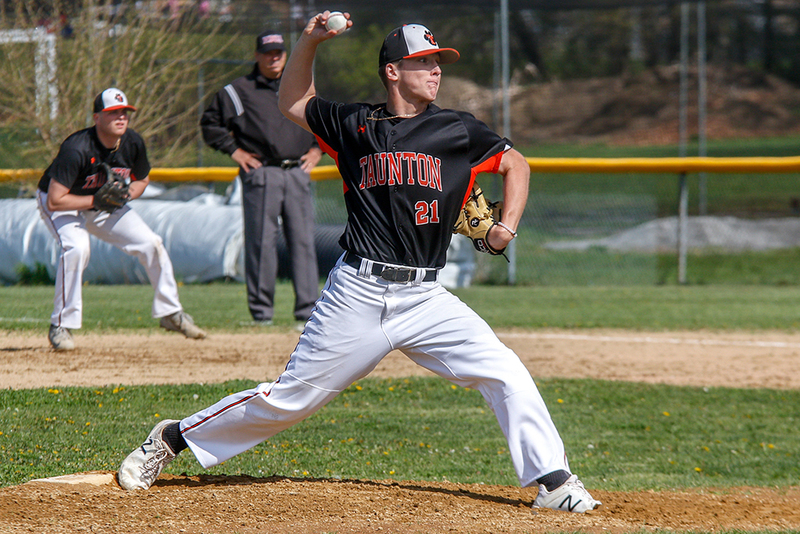 Sophomore John Carney pitched three innings in relief with five hits, five strikeouts and three earned runs allowed. Mansfield baseball finishes the season at 19-5.